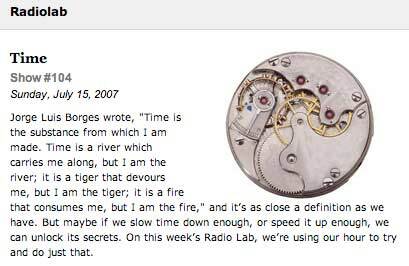 The folks at Radio Lab have produced a good piece on time in general. It covers a lot of materia, some of it more campy than informative, but had some new info for me at least. Spice Clock: A clock that tells you what time it is in the dark based on smells released during the night. Clock of Birds: A highlands people of Papua New Guinea use the songs of certain birds to determine the time of day. Clock of Flowers: Linnaeus carefully crafted a flower garden that had certain flowers that would unfurl at certain times of day to tell the time. Leif Inge produced an art installation of Beethoven’s 9th that was stretched to 24hours which sounds wonderful. The piece ends with a discussion of how time is relative based on experience, and how the very best moments we remember in life have a feeling of a swolen now.